Smartphones are an important part of everyday life, and you likely carry yours with you pretty much everywhere you go. But using your smartphone while you’re driving can be incredibly dangerous, with roughly 26% of all car accidents involving cell phone use. A car holder for your phone allows for safe and easy hands-free operation. There are many different styles of car phone holders. How do you know which one is best? After careful, 100% impartial review, we’ve found eight great cell phone holders you’ll want to consider, and we’ve also created a complete buyer’s guide. What are the Benefits of a Car Smartphone? What Types of Cell Phone Holders are Available? 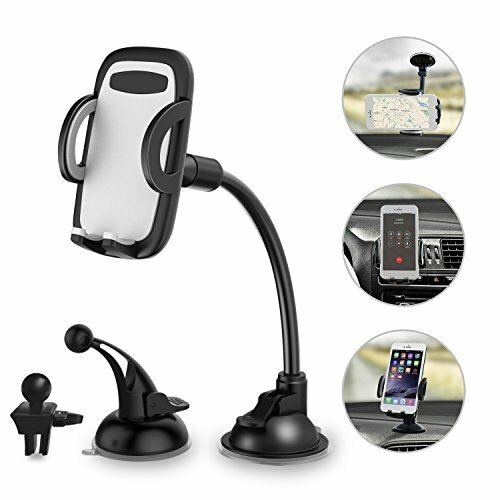 How Do I Find the Best Car Cell Phone Holder? Adjustable, easy-to-install and durable, the Abaloux Air Vent Phone Mount securely holds practically any type of cell phone. With a deceptively simple design, the Abaloux Air Vent Phone Mount is easy to install and use. Full 360-degree rotation allows you to adjust the phone’s position when talking, charging, navigating, listening to music and more. A button on the back slides open to release the phone instantly, while also holding the phone securely in place even on rough roads. No matter what type of phone you have, chances are good it will fit into the unit. Compatible with iPhone 7 and 7 Plus, iPhone 6 and 6 Plus, Samsung Galaxy S6, HTC, LG, Nexus, Nokia and more. Made from high-quality ABS, PC and PVC materials for long-term durability as well as temperature resistance. This dashboard-mounted phone holder offers a clear screen view in practically any conditions. With triple reinforcement, the Bosynoy Cell Phone Holder sits on the dashboard where your phone can be displayed horizontally. Ideal for SUVs, pickups and other high-profile vehicles. Fits most iPhone and Android devices, as well as most GPS devices including Magellan, Navman and more. The concave silicone base sits securely on the dashboard. Both the upper and lower ends of the clamping components are padded with soft-textured rubber. A sloped shell cover protects the screen from direct sunlight, preventing damage while also increasing readability. Transform your CD player slot into a dash-mounted phone holder. Holds practically all Android and Apple cases up to 3.63 inches wide. Fully poseable 360-degree head allows you to adjust the viewing angle on the go. Easily secured to any single CD slot, although doesn’t support multi-CD changers. Requires no mounting screws or other complicated setup procedures, making it a good choice to use across multiple vehicles. Also can be used in boats. This latest version of the popular iOttie phone holder includes an improved telescopic arm and new sliding bottom foot. The new arm is two inches longer than the previous models, allowing for a greater range of viewing. Additionally, the redesigned bottom foot prevents interference from the bottom ports. A secure suction cup and sticky gel pads keep the holder in place even on textured or curved surfaces (although won’t work with leather or vinyl). Capable of holding practically any phone up to 3.2 inches wide. Suction cup can withstand repeated use so the holder can easily be moved from vehicle to vehicle. 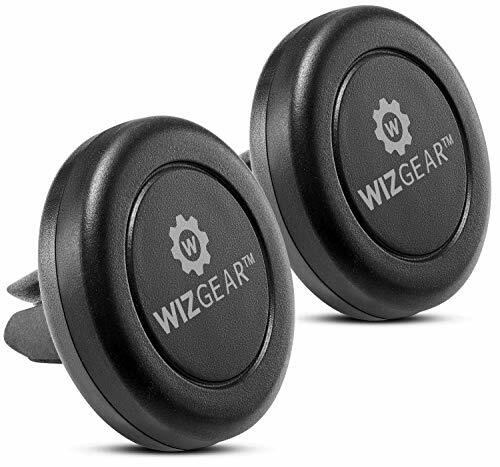 WizGear’s car mount has an elegant simplicity which makes them secure and easy to use. 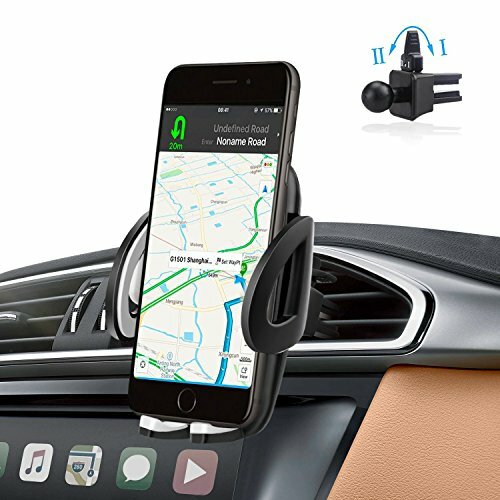 The base is made from high-quality rubber which provides a solid hold on the magnetic head, keeping your phone in place even when driving on uneven terrain. The main feature here is the reinforced magnetic phone holder. With a smooth surface and intense magnifying surface, the mount holds virtually any smartphone or even mini-tablet. Once attached, the phone can be rotated and swiveled into practically any position. 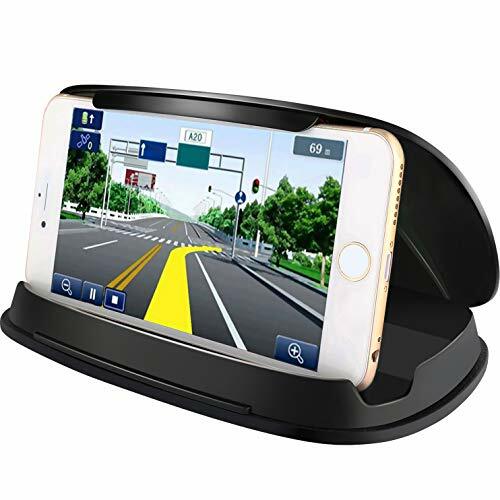 Flexible mounting options along with a flexible neck, this smartphone holder is perfect for practically all dashboard designs. 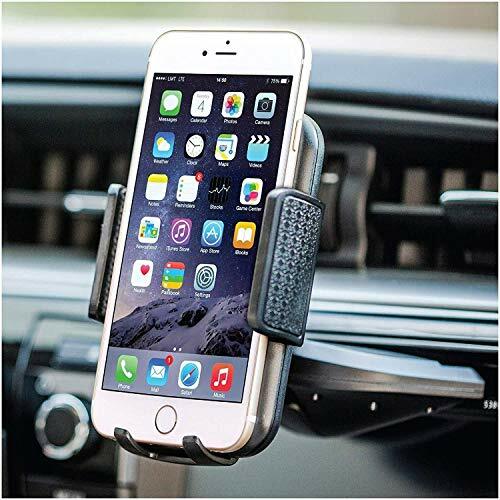 This cell phone holder from LotFancy uses a vacuum suction cup which can be mounted on either the dashboard or windshield. The suction cup won’t slide off in hot or cold weather or leave behind marks on the dashboard. The unit is one of the most flexible on the market with a long gooseneck which can be rotated 360 degrees. Requires no tools for installation. Aside from holding a smartphone, also perfectly sized for GPS devices, too. Supports any device between 1 5/8th and 4 1/2 inches wide. Secure and solid, this phone holder mounts in your vehicle’s cup holder, where it can securely support even large devices. Looking for an alternative to dashboard and windshield mounted phone holders? The Cellet Universal mounts into your center console cup holder. Fits any vehicle cup holder between 2.86 inches and 3.47 inches. Often more secure than a suction cup. Soft holder grips and backing keep your device secure while preventing scratches and other damage. An extra-strong 10-inch arm provides the 360-degree rotational capability. Fits Apple iPad and Galaxy devices. The I&F Car Phone Holder can be mounted on the windshield, dashboard or air vent, allowing for hands-free phone operations in practically any type of vehicle. Don’t let your phone be a dangerous distraction. 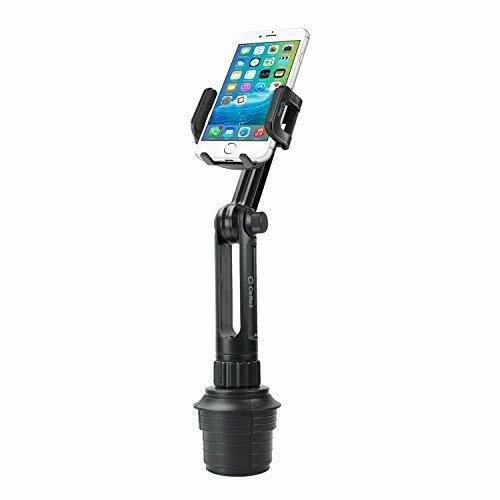 This holder from I&F can be mounted practically anywhere inside your vehicle. But no matter where you put it, the unit securely holds both iPhone and Samsung devices as well as most GPS units. One-button release allows for quick removal when you’ve arrived at your destination. All I&F holders are backed by a one-year warranty. Very few things are potentially more distracting than using a smartphone when behind the wheel. Reading texts, scrolling through apps and other actions cause you to take your eyes and attention off the road. Even just a few seconds of distraction can result in a catastrophic accident. Aside from being dangerous, using your smartphone when driving might also be illegal. Forty-seven states ban texting while driving and 15 ban hand-held phone use when driving entirely. Aside from helping to prevent accidents, a holder also prevents you from getting pulled over and ticketed. Check your local laws for more information about cell use while driving in your state. Plus, cell holders also improve sound quality. Placing the cell phone near the dashboard or center console allows for clear voice communication. Often a great option if your car isn’t equipped with Bluetooth. Generally, there are four different types of cell phone holders. This uses a plastic prong-like design which slips directly into the A/C vents in your car’s center console. Placement is ideal for talking and listening. Plus, there’s no risk of damaging your dashboard or windshield. Air vent phone holders have two minor downsides. Some designs can block the auxiliary ports on the bottom of certain models of phone. Additionally, this type of holder might not work if the vents in your car are curved. These holders use a suction cup to attached directly to the inside of your windshield, so the phone is suspended in the air over the dashboard. Windshield-mounted phone holders are easy to move, making them a good choice if you regularly drive different vehicles. Make sure you avoid cheaper windshield-mounted holders, as they often don’t stay attached to the windshield. Additionally, the suction can be affected by extreme hot and cold temperatures. 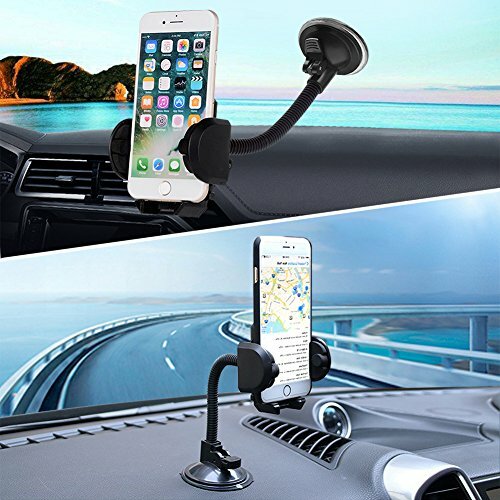 These holders use a suction cup or sticky pad to attach to a dashboard. Many dashboard-mounted holders use a shell to block sun glare on the phone, allowing for easy viewing in all conditions. Dashboard-mounted holders are often a good choice for high-profile vehicles such as SUVs and trucks. Be careful applying the holder to the dashboard, especially if any sticky substance is used. There is a risk the adhesive could leave behind a permanent mark. Many dashboard-mounted phone holders aren’t easy to move once applied. Finally, phone holders are available which fit into your car’s cup holder. Unlike other holders, these ones aren’t working against gravity, making them the most secure types of phone holder overall. However, there are also some size limitations. Excessive large phones or ones with large cases might not fit depending on the size of your cup holder. First, you’ll want to determine where in the car you want to place the holder. The pros and cons are listed above. Certain interior car designs will naturally lend themselves to an ideal type of holder, so choose the one which will work best for your car. Next, you’ll want to consider the materials used. The main structure of the car cell phone holder should be made of a durable but lightweight plastic. If the holder is too heavy it might not stick to the dashboard or window. You also want to look for rubber padding on the parts which actually hold the cell phone. This avoids any accidental scratching. Typically, you’ll want to avoid any holder which allows for direct contact between any plastic parts and your phone. The best cell phone holders are easy to use. Look for one-button detachment. This lets you grab your cell phone quickly when you’re leaving the car. Finally, the holder should be easy to install. Most holders simply attach using a suction cup or plastic prong. There’s usually no need to use a holder which you need to permanently screw into the dashboard. A cell phone holder might seem simple, but it’s invaluable when behind the wheel. Not only is a hands-free phone easier to use, but it also helps prevent driver distraction, a leading cause of auto accidents. 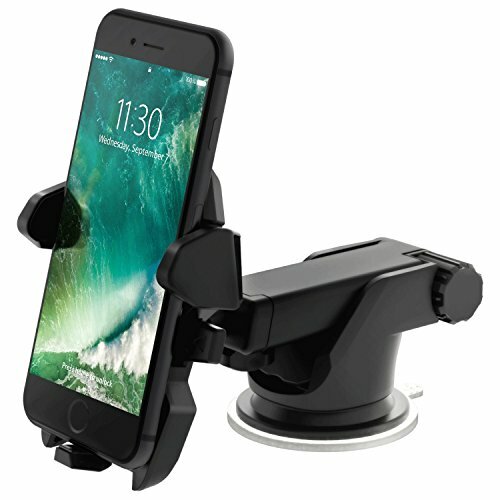 When selecting a car smartphone holder, choose the right type of mounting for the design of your vehicle. You’ll also want a holder made from lightweight, durable plastic with rubber grips. Don’t risk your life for a text or a call. The right cell phone holder for your car combines convenience and safety.